Find a Buddy Holly Tribute Act for hire near you in minutes! Option 1. Enter your event location below & contact a Buddy Holly Tribute Act directly! Option 2. Request multiple quotes from available Buddy Holly Tribute Acts Get Quotes! Option 3. 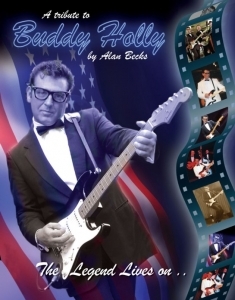 Read information & advice on hiring Buddy Holly Tribute Acts Read Advice! What exactly will a Buddy Holly TRIBUTE ACT do at your event? Buddy Holly is one of the most iconic singer/songwriters of the 20th century! Together with his band of musicians, The Crickets, Buddy was known for being one of the inventors and pioneers of Rock ’n’ Roll! A Buddy Holly Tribute Band will play the best songs of Buddy Holly’s short but glittering career! This includes classic songs such as; ‘That’ll be the Day’, ‘Words of Love’, ‘Peggy Sue’, ‘Everyday’, ‘Maybe Baby’ and ‘Oh Boy!’. Buddy Holly is one of those rare artists who has released more songs than you might have initially realised, and with the wildly successful ‘Buddy’ musical, the music of Buddy Holly has been kept well and truly alive! When you book a Buddy Holly impersonator, you will not only get a professional musician who will sound exactly like Buddy, but you will also get an actor who will look just like Buddy Holly, wearing the famous Buddy Holly glasses and suit. As well as this, they’ll also incorporate Buddy’s stage-moves to make for a thrilling, real-life show! Mainly, an Buddy Holly Tribute Band will entertain your audience with a fantastic live show that will put the wow factor into celebrations and impress your guests, whatever their entertainment tastes may be. What event types are Buddy Holly Tribute ACTs hired for? One of the great aspects of Buddy Holly’s music is that he had such a diverse mixture of songs! When you hire a Buddy Holly Covers Band for a wedding ceremony, you can expect to hear Buddy’s most romantic songs. We would advise to request that the Buddy Holly Tribute Act plays a song as the bride is walking down the aisle. For this special moment, we would advise to request they play a song such as the gentle ‘Everyday’, or the slushy ‘True Love Ways’. You may then want to request that the Buddy Holly impersonator performs a classic, up-beat Buddy Holly song when the couple have been announced as man and wife! To add a real happy atmosphere, we would advise for the Buddy Holly band to play a song such as the sublime ‘Peggy Sue!’. The 1950’s Rock ’n’ Roll sound would perfectly suit a wedding drinks reception as it’s universally loved! Your wedding guests will enjoy the sound of a live drummer, the thumping of a double bass and plinking of a 1950’s styled guitar, not to mention a Buddy Holly lookalike singing the best Rock ’n’ Roll songs of all time! The wedding reception is the time of the wedding day when things become a bit more laid-back and serene, with some of your wedding guests getting to know each other for the first time. What better way is there to soundtrack this beautiful moment than by hiring a Buddy Holly Tribute Act to play songs such as ‘Rave On’, ‘Not Fade Away’, ‘Maybe Baby’ and ‘Raining in my Heart’. This is great live act to hire as the refreshments are being enjoyed! Hire a Buddy Holly impersonator for your wedding breakfast entertainment and your family and friends will love the amazing atmosphere of the live 1950’s music on offer! The Buddy Holly Tribute Band can be set up to perform inside of the wedding breakfast venue in time for the bride, groom and guests to enter. The band can carry on performing as everybody tucks into their wedding food and fizzy refreshments right up until the wedding speeches and the cutting of the wedding cake! The music of Buddy Holly will not be over-bearing and will be a gentle yet striking background music to hear at this very personal and enjoyable moment. Buddy Holly songs to hear at the wedding breakfast may include ‘Oh Boy’, ‘It’s so Easy’, and ‘Think it Over!’. Looking for a Buddy Holly Tribute Act for your wedding evening reception?! Well, look no further! A Buddy Holly Tribute Band will perform songs which will get your wedding party off in full swing! You can expect to hear such songs like; ‘It Doesn’t Matter Anymore’, ‘Oh Boy’, ‘Peggy Sue’, ‘Not Fade Away’ and ‘Rave On’, as well as the ballads of Buddy Holly such as ‘Everyday’, ‘Listen to Me’, ‘You’ve got Love’, ‘Heartbeat’ and ‘Moondreams’. How about hiring a Buddy Holly Tribute Band to perform a live song for the all important first wedding dance?! For this precious moment, we would advise to request that the band perform something such as ’True Love Ways’, which includes the very romantic lyrics ’Throughout the days, our true love ways, will bring us joys to share, with this who really care’. Hire a Buddy Holly Tribute Act for your corporate event and you will have a group of talented musicians performing some of the best Rock ’n’ Roll songs of all time! You may be searching for a Buddy Holly impersonator for your work party? A Buddy Holly Tribute Act will be an excellent choice for your work Summer party, a colleague’s leaving party or a work Christmas party! The Buddy Holly lookalike will perform the greatest hits of Buddy Holly which may include songs such as ‘Everyday’ and ‘Peggy Sue’. Buddy’s songs are still to this day recognised and popular at karaoke, so you can be sure that your colleague’s will be able to bond as they sing along to the best of Buddy Holly! 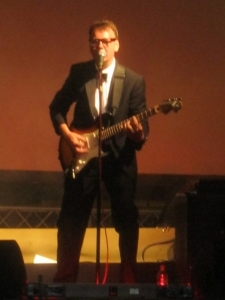 You may want to book a Buddy Holly impersonator to sing and play live at your trade show or your product launch? The music of Buddy Holly is inoffensive and instantly recognisable, making it the perfect type of music to boost interest in your product. The Buddy Holly Tribute Act can be set up to perform at a shopping centre or in a shop and will certainly turn heads with that striking Buddy Holly image! How about booking a Buddy Holly Tribute Act for cruise ship entertainment or holiday camp entertainment? The feel-good feeling of Buddy’s music will be an excellent choice in getting your holidaymakers in the mood for partying! Searching for a Buddy Holly impersonator for your party? 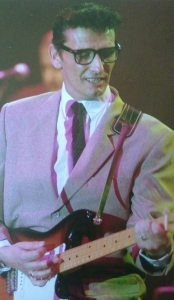 Why not hire a Buddy Holly Tribute Act for your 1950’s themed party?! Your 1950’s themed party can be decked in 1950’s Americana memorabilia and you can request your friends and family dress in 1950’s fashions, all the while soundtracking this with a professional live band performing the best of Buddy Holly! How much do Buddy Holly tribute ACTS cost to hire? Our simple to use entertainment directory allows you to firstly search for the best Buddy Holly Tribute Acts who are local (or travel to your area) and then via the contact form you may message them directly to enquire for a no obligation quote to perform at your event. Some acts will also add a rough price guide to their profile for your convenience. What are the usual set formats and performance lengthS for Buddy Holly tribute acts? A Buddy Holly Tribute Act can tailor their performance times to suit you and your event, however, on average, a professional Buddy Holly Tribute Act will perform for two 45 minutes sets. How much space will a Buddy Holly tribute act need at your event? If your Buddy Holly Tribute Act comes as part of a full band, then you will need space for a full band back-line. This will mean that you’ll need a stage area of at least 4 metres by 3 metres. What equipment and set up requirements do Buddy Holly tribute acts need? As with most artists who sign up to Entertainersworldwide.com, a Buddy Holly Tribute Act will provide all of their own equipment. You may want to enquire if they need a PA to amplify their sound, in which case we would advise to use our easy to use messaging service to find out. We do ask that each performer gets a backstage area in which they can prepare for the performance ahead. If your venue does not have a backstage area, then we kindly ask that you enquire with the venue to seek an alternative space in which the performer can comfortably get ready to entertain. How can you find and book a Buddy Holly tribute Act with Entertainersworldwide.com? WANT TO RECEIVE A RANGE OF QUOTES FROM Buddy Holly Tribute Acts?